The Boston University men’s hockey team just added a stellar find to their 2018 recruiting class as Culver Military Academy Prep defenseman Dominic Vidoli announced his commitment to join the Terrier family. Vidoli is a grinder in a 6’0”, 170-pound frame, a force when it comes to corralling loose pucks and a terror on the boards. The Strongsville, Ohio native is willing to put his body on the line to stop a puck from sailing towards the net and should be someone Terriers head coach David Quinn can rely on to make sound decisions in the defensive zone. In his first full season with Culver Academy in 2016-17, Vidoli logged four goals and four assists while compiling a +16 plus-minus rating in his time on the ice. Vidoli improved his puck-handling and passing skills over the summer, and it has showed in the first 26 games of this season. The left-hander has poured in nine goals and 25 assists, becoming a staple of the Culver offensive attack. With the likes of defenseman Brien Diffley and John MacLeod graduating, expect Vidoli to get a chance at filling in the minutes that these two will void. Should he impress over the summer and gel with his fellow defenseman, Vidoli could become a common member of the defensive third line in 2018-19. Excited to announce my commitment to play college hockey at Boston University. Can’t wait to be a Terrier this fall. Much like the first night, the second day of the 2015 NHL Entry Draft proved to be a successful one for the Boston University men’s hockey program. Following center Jack Eichel‘s selection at No. 2 overall to the Buffalo Sabres, three players with connections to BU were selected on day two of the draft. The first of these draft picks was sophomore forward A.J. Greer at No. 39 to the Colorado Avalanche. Although Greer was ranked No. 69 by NHL Central Scouting and was projected to be drafted anywhere between late in the second to the fourth round, Colorado nabbed him early. Greer battled inconsistencies early in his BU tenure, but picked up his play during BU’s postseason run. He had a chance to play on the second line and made contributions, including a goal during the national semifinal against the University of North Dakota. The next of the selections was soon-to-be-freshman forward Jakob Forsbacka-Karlsson at No. 45 by the Boston Bruins. Forsbacka-Karlsson, who was ranked No. 31 by Central Scouting and 52nd by TSN’s Bob McKenzie, joins captain Matt Grzelcyk as a Bruins prospect. With the USHL’s Omaha Lancers this season, the 6-foot-1 Karlsson had 53 points in 50 games. The Sweden native is considered a two-way center that can skate well and win faceoffs. 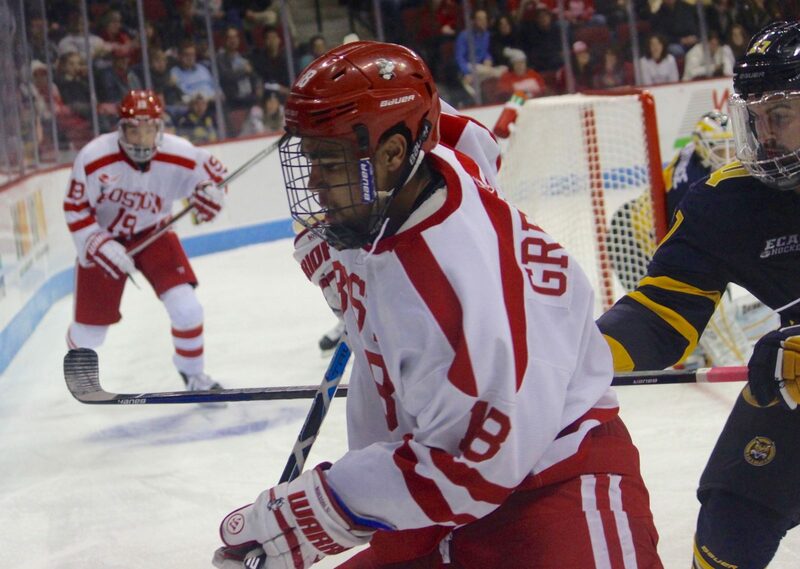 Another 2015 commit, forward Jordan Greenway, rounded out the BU selections when he was taken No. 50 overall by the Minnesota Wild. Standing at 6-foot-4, Greenway is a highly touted power forward in this year’s recruiting class. He had 44 points while playing with U.S. National Under-18 team, which included a trip at Agganis Arena. Although they were ranked by ISS Hockey, sophomore defenseman Brien Diffley and incoming freshman forward Bobo Carpenter were not taken in the draft. In all, 23 current or future Hockey East players were selected this season, the most of any college hockey conference. BU and Boston College led the conference with four picks each. Boston University men’s hockey coach David Quinn announced junior captain Matt Grzelcyk will serve as the Boston University men’s hockey captain for 2015-16, while freshman forward Jack Eichel, junior forward Danny O’Regan and junior forward Matt Lane were named 2015-16 assistant captains at the 52nd annual Friends of BU Hockey Banquet on Friday evening at the Metcalf Hall in BU’s George Sherman Union. Grzelcyk also confirmed at the ceremony that he will return for his senior season. Additionally, eight awards were presented at the ceremony. 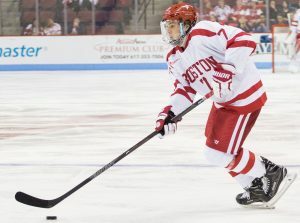 Grzelcyk was awarded the Clifford P. Fitzgerald Scholarship, presented annually to an “outstanding rising junior or senior defenseman.” In his first season as captain of the Terriers, Grzelcyk collected CCM First Team All-American, Hockey East First Team All-Star and Hockey East All-Tournament Team accolades. Freshman center Jack Eichel was named the Ed Carpenter Award recipient, given to the BU skater that leads the team in scoring. In an impressive freshman campaign, Eichel led the Terriers — and the nation — with 71 points in 40 games. In its third year of circulation, the Iron Terrier Award — awarded to the Terrier player who best displays “character, strength, dedication and discipline in the weight room and off-ice training” — was handed to Hohmann. 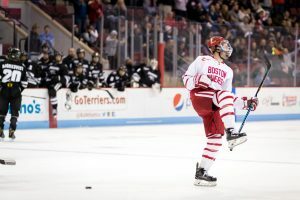 Flying under the radar as an unheralded recruit out of Buckingham Browne and Nichols, freshman defenseman Brien Diffley became a relied upon member of the BU blueline and was subsequently given the Most Improved Player Award. After capturing the third BU player to capture the Hobey Baker Award, Eichel was bestowed with the George V. Brown Most Valuable Player Award. With the scarlet and white captains already in place for the 2015-16 season, the ceremony ended on a look ahead, as the Terriers will open the new year in Schenectady, New York, taking on Union College on Oct. 10. Conor Ryan contributed to the reporting of this article. In the No. 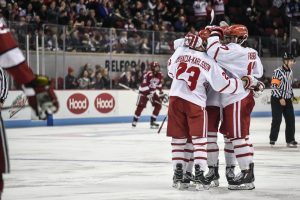 1 Boston University men’s hockey team’s first game in 15 days, the Terriers earned a 3-3 tie against the defending national champions, Union College, at Agganis Arena. Senior assistant captain Evan Rodrigues’ goal with just more than four minutes remaining in regulation salvaged the tie for the Terriers. His goal was one of many positives for BU on Saturday. The Terriers returned two key players who had missed nearly two months to the lineup on Saturday, and both had a positive impact on the result. 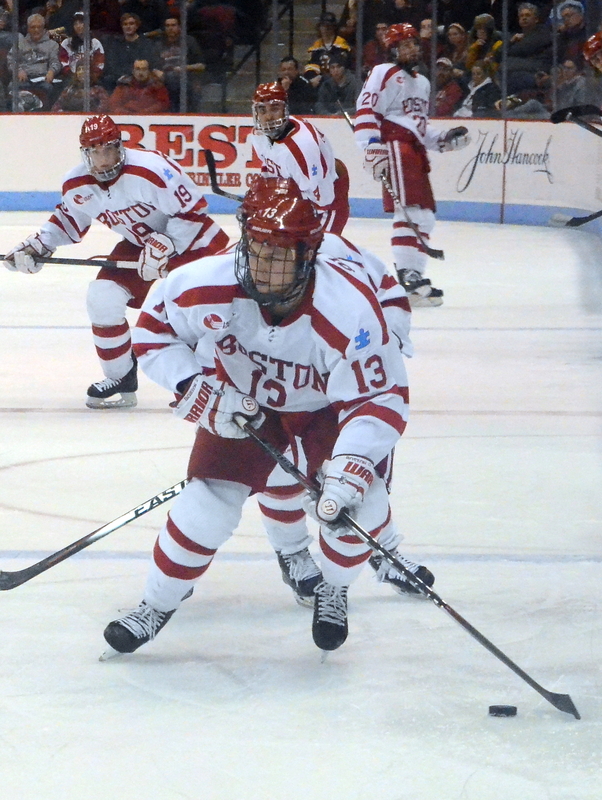 Sophomore forward Robbie Baillargeon — BU’s leading scorer last season — saw his first playing time in nine games. He recorded two shots on goal. Freshman forward Nikolas Olsson, who had also missed nine games, tallied a goal and was a plus-1 on the evening. 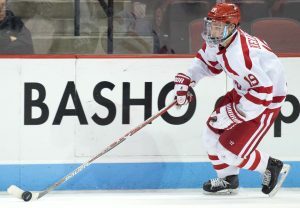 BU played without freshman forward and leading scorer Jack Eichel, whom the coaches chose to bench after he competed for the United States in the IIHF World Junior Championships during winter break. But still, three freshmen made it on the score sheet Saturday: forward A.J. Greer, who had the game-opening goal, defenseman Brien Diffley, who added an assist, and Olsson. Greer’s goal came off a rebound to open the scoring 5:47 into the game. 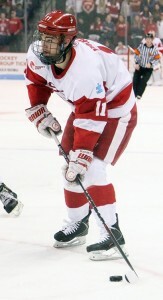 It was his second goal of the season, and his first since BU’s 8-1 win over the University of Massachusetts on Oct. 10. Diffley’s fourth assist of the season came on Olsson’s goal — his third of the year — at the 13:42 mark of the 1st period. Union presented a physical test to the Terriers, which BU matched with a consistent tough effort. The Terriers had a number of physical challenges along the boards — in turn, accumulating five penalties on the night, but Quinn said he was pleased with the effort. Olsson’s return gave BU a boost physically, and he said he was happy to come in and get a few big hits. “The first thing I thought about was going out and getting a hit,” Olsson said. “That’s how I kind of … get more mentally into it than you can get just by prepping yourself. 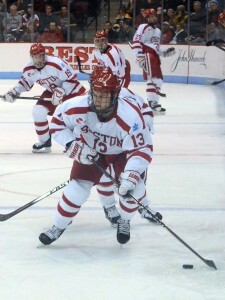 Quinn noted the significance of Olsson’s return to the lineup as pivotal to the Terriers’ physicality. As previously mentioned, it was the Terriers’ first game action in 15 days, and their first regular-season matchup in three weeks. Quinn mentioned before the game that he had some concerns about the team having a bit of dust, and said that he thought BU’s effort early was a bit shaky. He did note, however, that BU was able to settle in, save for some rough play in the second frame. The Terriers allowed three goals in a game for the first time since Nov. 25 — just one of three times this regular season they have given up three or more scores to an opponent. Midway through the first period, with the game tied 1-1, freshman defenseman Brandon Fortunato trailed Union forward Daniel Ciampini on a breakaway attempt. He wrapped his stick around, but was unable to stop the attempt from reaching the back of the net. 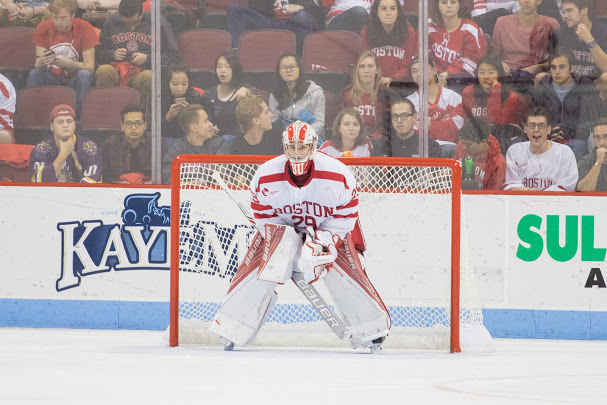 BU also left a number of wide-open chances for the Dutchmen when junior goaltender Matt O’Connor couldn’t control a few rebounds, which at one point early in the game led to a goal for forward Spencer Foo. Trying to earn its second weekend sweep of the season, the No. 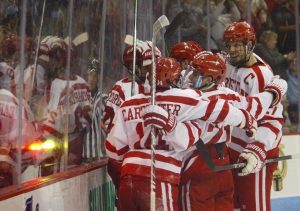 5 Boston University men’s hockey team played to a 4-4 draw with the University of Connecticut Saturday night. 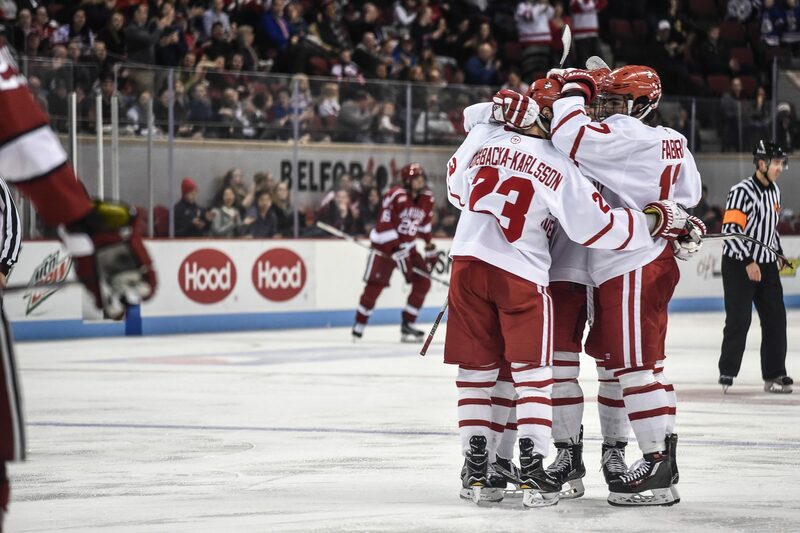 The Terriers (5-1-1, 3-1-1 Hockey East) scored within the first 40 seconds of the game on junior forward Danny O’Regan’s goal, but the Huskies (2-4-3, 1-2-1 Hockey East) battled back in a neck-and-neck, fast-paced affair. Junior Mike Moran scored his second goal of the season in a 4-4 tie with UConn. Against Boston College at Conte Forum Friday night, the Terriers didn’t get any sustained attacking time early. It took over three minutes for the team to get a chance on net. Saturday was a completely different story. Even without junior forward Ahti Oksanen in the lineup, the first line was aggressive from the get-go. Freshman forward Jack Eichel skated down the left wing, and fed O’Regan on a cross-ice pass down low. After a few pretty deke moves, O’Regan buried the shot past goaltender Rob Nichols. The top BU forwards continued their impressive play even after the opening goal. After multiple chances throughout the first and second periods, the two were rewarded for their hard work with less than five minutes to go in the third. Eichel started the rush when he sped out to center ice. As O’Regan charged toward the blue line, the freshman split the defense with a pass, allowing O’Regan to spring forward. The junior did the rest, and after fancy stickhandling in front of Nichols, O’Regan found himself on the scoresheet again. The two finished the night with three points each — Eichel with three assists and O’Regan with the two goals and an assist. When the 2014-15 season started, junior forward Mike Moran was out of the lineup with an injury. Freshman defenseman Brien Diffley found himself on the third defensive pairing. On this night, though, both made big contributions in the tie. For a more in-depth look at Diffley, check out Conor’s sidebar. Moran, who scored his first goal of the season on Friday night, added his second of the year against UConn 30 seconds after the Huskies grabbed a late lead in the third. After Diffley took a shot from the point, Moran batted in the puck out of mid-air — and under the crossbar — for the goal at 9:30 of the second period. How does a plus become a minus? When complacency sets in, issues can arise and create chances for the opposition. This is what Quinn said happened after BU’s first goal of the game. After O’Regan’s opening tally, things were far from being painless. UConn scored about three minutes later on a rebound by forward Shawn Pauly, his first of two on the night. 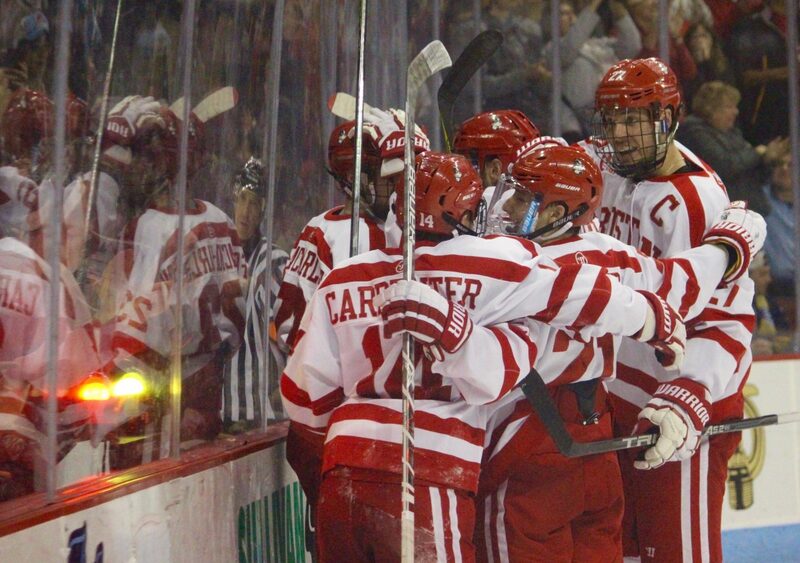 BU held two one-goal leads throughout the game, but none lasted more than 3:08. As much as Quinn has used the word “resilient” to characterize the Terriers, UConn threatened all night and was not deterred by the initial goal. What seems to be a recurring theme for this Terriers team is the amount of time it spends on the penalty kill versus the man advantage. Before the game against UConn, the Terriers had 66 total minutes shorthanded against 40 on power-play chances. By the end of the night, the Terriers added seven more penalties to its season total. There were two infractions, though, that hindered the Terriers the most. BU was forced to work with one less skater on its bench after freshman forward Nikolas Olsson’s game misconduct for making contact to the head at 15:29 in the second period. Quinn used a combination of players like Moran and sophomore forward Kevin Duane on the second line to keep things stable. Then at the end of the third and teams in the midst of a 4-on-4, junior captain Matt Grzelcyk held forward Trevor Gerling as he drove to the net. On the ensuing Huskies power play, Pauly scored his second goal of the game, which was the final score of the contest. “It’s nothing new, Quinn said of the penalties. “You look at what’s happened this year, we probably have the biggest discrepancy between power plays and penalty kills. I can’t explain it, I don’t want to talk too long about it. Other than penalties being a major issue, the Terriers had their difficulties defending the second line. Pauly, who did not have a goal coming into the game, finished with two tallies, five shots on goal and a plus-2 rating. Gerling doubled his season output with two goals, while also adding two helpers. UConn’s first unit had trouble keeping up with BU’s top line, but the Huskies’ second line combined for seven of UConn’s 12 points.